Now you can get a great shave without spending over $50 for a shaver. The Bell & Howell® Triple-Head Rechargeable Shaver has precision stainless steel blades that flex to follow the contours of your face and neck for an exceptionally smooth, comfortable, close-up shave. 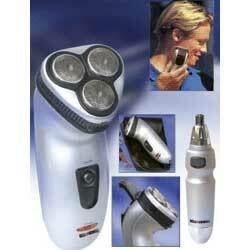 The pop-up trimmer keeps side-burns, mustaches and beards neatly groomed. Works with or without the cord so you can always look great...at home or on the go. Holds an 8-hour charge for 7 days. Comes with a battery-operated nose and ear hair trimmer as a Free Bonus.